You might not think that there's a big difference between backyard picnic tables, what you see at the park and school picnic tables, but the differences can be important. The picnic tables that are in most public places weren't made specifically with a child's body in mind. 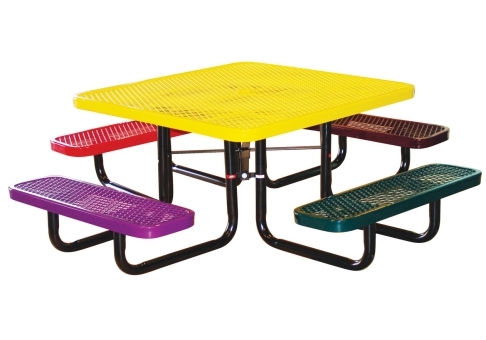 Kids have different needs and school picnic tables are easier and more comfortable for kids to use. Plus, you can find them in any fun color and a range of sizes. The first step in choosing the right kid's picnic table is to determine exactly what the table will be used for; what are your specific needs for the table? This is going to help you narrow down your choices and make the selection process much simpler. You would be surprised by how many different choices there are for children's picnic tables. Wood Picnic Tables — This is the most classic picnic table style. These are what you would likely see in a park or other public picnic location. Most often the wood on these tables is treated, which makes them easy to paint. Aluminum Picnic Tables — There are several different types of aluminum picnic tables. The difference in tables is connected to the size of the steel pipes that are used for the frame. These last long because they resist corrosion, but be sure to look for kids sizes. ADA Picnic Tables — ADA compliant picnic tables meet the needs of individuals who are in wheelchairs. A space is left on one end where the bench is cut short so that a wheelchair can be rolled up alongside the other kids. These are one of the better choices for a school or children's area. Kids Picnic Tables — Of course, these picnic tables are designed with a smaller framed person in mind, which makes them better and safer for children. Most often made from steel, these tables are built so they are solid and stable, to avoid any issues with children tipping or falling. The best thing to do once you have a clear idea of the picnic table style that you want is to start shopping around. Choose a kids picnic table company that offers a warranty and backs up the work that they do.